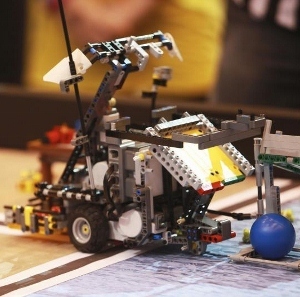 (CNS): Kids from a local school robotics club have won a coveted trophy at the regional Lego tournament in Florida in the first league of its kind. Cyber Rays, the Cayman Prep High School robotics club, won the Core Values trophy at the regional First Lego League tournament in Orlando earlier this month and have now advanced to the Florida State Championship to be held at the University of Central Florida in March. On Feb 2, the team of year 8 and 9 Prep students School competed in the one day tournament and secured one of the places in the state championship following a table run with 19 potential missions to complete within each 2.5 minute round. Robotics is now a part of the curriculum at Cayman Prep High School using the LEGO NXT programmable brick system and accessory sensors. Cayman Prep sponsored Allison Smith, ICT teacher and Cyber Ray’s head coach, who completed five days of training at the National Robotics Engineering Center (NREC) in Pittsburgh, PA, two years ago. The NREC is part of the Carnegie Mellon University Robotics Institute, a world-renowned robotics organization. Smith, like all students at NREC, was introduced to the Lego robots and NXT-G programme as a part of a STEM (Science, Technology, Engineering and Math) curriculum. Much of that training has now found its way into the Prep School curriculum with robotics an integral part of many classes.